The catcher’s mask was introduced in the 1870s, and at the time it wasn’t very well-received. It was the object of ridicule at the first game where it was worn. Fans and the press both didn’t see the value. As this article in the New York Times details, the catcher’s mask was developed by Harvard baseball team manager Fredrick Thayer who patented the mask in 1878. The mask ultimately “changed how the game was played” as a pitcher no longer had to worry about injuring the catcher. The Spalding company quickly advertised its own version, without paying Thayer royalties on his patented invention. The case went to court and Thayer won, making him a great example of using patent rights to reward an innovator. Spalding went on to popularize the catcher’s mask. Just another great example of the power of licensing in action. We’ll be sharing more stories in the coming weeks and months. Patient licensing has widely been sensationalized as being a real threat to the innovation-promoting benefits of the patent system. However, as detailed in my last post, nothing could be further from the truth. The August 2013 report from the US General Accountability Office (GAO) on US patent infringement litigation confirmed, both directly and indirectly, the view that there is no NPE patent litigation crisis and that, to the extent that there are problems with the patent system, they are linked primarily to patent quality, particularly in software-related patents, and to not the identity of the patent owner (e.g. NPE, PAE, PME, operating company). With that in mind, the question then is how can you distinguish a legitimate NPE licensing firm from a troll? It’s simple: examine their actual behavior, not their identity as NPEs. Legitimate NPEs employ a rigorous due diligence process to ensure that the patents they license are of good quality and highly likely to be upheld as valid by the courts and by patent office trial boards. Just as companies that manufacture products do, a legitimate licensing firm generally will resort to litigation to enforce its valid patents only after protracted good-faith negotiations with potential licensees have proven unsuccessful. They do not use the threat of litigation to seek nuisance settlements, nor do they threaten litigation against startup companies, product retailers, or retail consumers unless they directly compete with the licensor. Patent trolls, on the other hand, often use low-quality or over broad patent claims to threaten litigation against hundreds of small businesses each year, even retail establishments such as coffee shops and hotels. They claim these businesses are infringing their patents simply by doing something as innocuous as scanning a document to email or offering WiFi access to customers. They then demand settlements of a few thousand dollars or threaten the business with an infringement suit that can cost literally millions of dollars to defend against. These suits are known as strike suits—i.e., suits filed to extort nuisance settlements that are less than the cost of litigation—and are unfortunately nothing new in American courts. Similar suits are also filed every year in the personal injury, product liability, and shareholder rights arenas. In fact, personal injury and product liability suits outnumber patent suits by 10 to 1 every year. And given all the stories of ambulance-chasing lawyers and faked whiplash injuries, not to mention of people carrying cockroaches into fast-food joints and crying foul, it’s likely there are many times more abusive personal injury and product liability suits than abusive patent suits each year. Abusive patent suits, however, are today generating public outrage, and it’s easy to see why. These patent trolls are corrupting a vital and venerated social compact to promote innovation by granting to inventors the exclusive right to profit from their discoveries for a limited time. What can be done to stop them? The courts can, and increasingly do, sanction abusive litigants by making them pay the legal costs of the defendants they falsely accuse. And lately there have been calls from Congress and from the judiciary to apply these sanctions more often. But while we can certainly reduce abusive litigation, we may never do away with it completely. It’s the price we pay for ensuring free and open access to the courts by every citizen. As for universities, R&D leaders, and legitimate patent licensing firms, these NPEs will remain a vital contributor to the U.S. economy—and as always, a fertile incubator of the next generation of startup companies that go on to change the world. Read more about patent licensing by downloading the Patent Licensing: The Founding Fathers’ Secret for Economic Success paper. Click here to download the paper now. Today’s post is from David Fraser, Manager, Patent Acquisitions, Conversant. The LES (Licensing Executives Society) held its annual meeting in Philadelphia last week. The annual meeting brings together approximately 1000 licensing professionals for the premiere licensing conference in North America. Participants are from high tech, pharmaceutical, technology transfer and other industries. 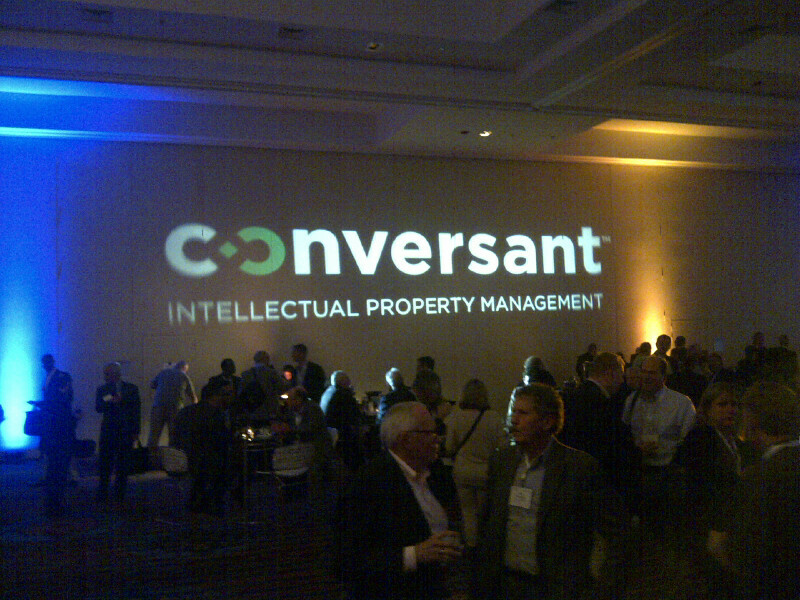 The conference kicked off on Sunday night with a reception sponsored by Conversant IP. The event was extremely well attended and gave us the chance to introduce our new name and branding to licensing professionals. The conference lasted three days with plenary addresses each morning, workshops on a variety of topics after lunch, and networking events each evening. The workshops typically take the form of a panel discussion of experts discussing a topic of interest. Lots of interesting ideas and innovations were shared. The keynote speaker to kick off the conference was Richard Marsh, General Counsel of Myriad Genetics who spoke about the genetics business and the recent United States Supreme Court ruling on the patenting of human genes. Tuesday morning featured a panel discussing NPEs and patent licensing and featured speakers from a variety of practicing and non-practicing entities. The topic has been thoroughly discussed in the press the last few years but several of the speakers emphasized the issue of the cost and uncertainty of litigation as well as anecdotal evidence that the fear of patent litigation from NPEs is having a chilling effect on innovation from small startups. Since the patent system exists to promote innovation this is indeed a concern. Other sessions dealt with RAND royalty rates, the top court decisions of the past year (an annual favorite), and patent valuation. One of the key highlights of attending the LES Annual meeting are the new contacts you make outside your immediate field in a variety of licensing fields such as university technology transfer, health sciences, and the various service companies providing information on royalty rates and financial services. This year’s meeting lived up to expectations and was a great event to introduce our new name and brand. Feedback was uniformly positive and people were genuinely interested in hearing the Conversant story. Next year’s meeting is in San Francisco, and I look forward to attending October 5th to 8th, 2014. The truth is, however, that even though startup companies, university researchers, and technology licensing firms don’t manufacture products themselves, they still produce enormous value for the U.S. economy. Companies such as Dolby in sound systems, Tessera and Qualcomm in semiconductors, for example, function as NPE technology developers that help the U.S. maintain its technology leadership in critical economic sectors. Meanwhile, professional intellectual property management firms like Conversant—which licenses patents and is also an active developer of NAND Flash computer memory—act as intermediaries. They facilitate the transfer of new technologies to firms that are best equipped to develop them into new products, services and medical treatments and other inventions that benefit society. Patent licensing has proven to be especially valuable in today’s outsourcing-rich economy, where so many once-vertically integrated firms have spun off their product manufacturing operations to other firms and other countries. It enables these firms to focus on what they do best—invention in the case of R&D leaders, or manufacturing, marketing, and sales in the case of product companies. Patent licensing, the value of which in the U.S. was estimated to be worth $150 billion annually in 2006 also provides greater liquidity to the market for new technological innovations and makes that market more efficient. Yet still the myth persists that all NPEs are “patent trolls.” To be sure, there is a “patent troll” species of NPE that abuses the litigation process to extort nuisance settlements from small businesses unable to pay the huge costs of standing up to them in court. But these trolls—the patent law equivalent of “ambulance chasers” in personal injury law—should not be confused with legitimate NPEs whose primary business is invention and/or patent licensing, not litigation. Read more about patent licensing by downloading the Patent Licensing: The Founding Fathers’ Secret for Economic Success paper. Legitimate NPEs are not anything new in our economy. In fact, NPEs and patent licensing were actually authorized by the U.S. Founding Fathers 233 years ago as a way to kick-start the development of the new American economy. Remember, at the time of its founding, America had a backward agrarian economy, almost wholly-dependent on imports, and lacking in any significant domestic industry. The U.S. at the time had a standard of living lower than that of many South American countries. But how, exactly, could they do that? The Founders had studied the elitist British patent system, and they knew that patent fees there were 11 times the per capita income of the average citizen and that patent holders were required to practice or “work” their patents—i.e., manufacture products from their inventions. According to Bowdoin College historian Zorina Khan—her book “The Democratization of Invention: Patents and Copyrights in American Economic Development, 1790-1920” earned the Alice Hanson Jones prize in 2005 for outstanding work in economic history—the Founders also knew that these high fees and “working requirements” restricted innovation activity to a tiny handful of wealthy individuals with the factories (or the capital to build factories) needed to manufacture products. (In fact, says professor Khan, the exclusion of the “working classes” was regarded by British parliamentarians as one of the chief virtues of their patent system.) These high fees and working requirements also skewed invention towards incumbent capital-intensive industries, rather than the disruptive new industries that usually spark great economic advances. In order to rapidly develop the U.S. economy, then, the Founders “quite self-consciously” (to quote economic historians Naomi Lamoreaux at Yale and the late Kenneth Sokoloff of UCLA) designed a patent system that could do what no other had ever done before—stimulate the inventive genius and entrepreneurial energy of the common man. Simply put, they needed to expand the pool of productive inventors in our new nation to include as many people as possible, even those without the wealth or resources to commercialize their own inventions. They did this by first of all setting patent fees to a level any ordinary citizen could afford—less than five percent of the rate in Britain. Second, they decided not to impose “working requirements” on patentees. During the debate over HR-41 (the bill that became the first patent law in 1790), says professor Khan, “the Senate suggested requiring patentees to make products based on the patent or license others to do so, but the House rejected this as an infringement of patentee rights.” And third, they wrote the patent law expressly to facilitate the licensing and sale of patent rights, thereby creating the world’s first patent licensing industry. The results, as Jefferson would write 13 years later, have “given a spring to invention beyond my conception.” Indeed, the low patent fees, lack of working requirements, and ability to license patent rights turned inventing into a new income-earning career path for thousands of poor but technically-creative citizens. Whereas most of Britain’s few hundred inventors came from wealth and privilege, the vast majority of America’s many thousands of inventors came from humble beginnings. They were farmers, workers, merchants, mechanics, and artisans. The end result of the patent system was to fuel innovation in the U.S. as citizens saw that they could make a living by applying a little “Yankee ingenuity” to the problems of agriculture and industry, the U.S. per capita patenting rate, defined as the percentage of citizens who became inventors, soared. By 1885, the U.S. per capita patenting rate was more than quadruple the rate in Britain, and 85 percent of U.S. patents were licensed. A nation of inventors was born, and patent licensing quickly became the primary means by which inventions were turned into new products in the decades before in-house corporate R&D departments arose in the early 20th century.